Roofline is Glenhaven’s leading roofing specialist with proven expertise in roof restorations, roof painting, roof cleaning and guttering. Over the past 20 years, we have solidified ourselves as the most reliable, honest and customer focused roofing specialists in the industry. We understand that roofs suffer wear and tear and we offer roof restoration and repair services across Glenhaven and the surrounding suburb of Sydney. We ensure that the integrity of your roof is always in great condition and that the life of your roof is protected and extended. When engaging with a roofing company you really want to be sure your working with a roofing specialist who has experienced teams. Our philosophy in providing individual attention to each project means you receive the benefit of tailored options to suit your budget and roof restoration requirements to achieve the end results you had anticipated. We have earned a reputation built around our core values of honesty, integrity and reliability. We are committed to providing our customers with complete peace of mind when they choose to work with us, so we have backed our workmanship with a 7- year guarantee and a 10-year written guarantee on materials at no extra cost. We deliver Quality workmanship– Roofline only uses the highest-quality materials ensuring your roof restoration or roof repair lasts. We only employ roofing specialists and not commission driven sales staff. Our teams ensure you receive prompt, friendly and personal attention. Whether we are providing you with roof cleaning, roof painting or total roof restoration services you are guaranteed of a quality outcome. We are Reliable– Roof line is your local, Sydney Based roofing specialists recommended for providing quality roof restoration services using the very latest in equipment and technologies. Roofline services both residential and commercial properties and our highly experienced roof specialists use effective application methods to keep your roof looking pristine. We have the Experience– Roofline’s teams have more than 20 years’ experience servicing Glenhaven and the surrounding suburbs of Sydney. If you are looking for highly experienced, qualified roofers Roofline should be your first port of call. When you look for a roofing team, you can be assured that Roofline professional team of roof restoration experts will provide you with top-quality roof restoration services in Glenhaven. A professional roof restoration service from Roofline can help restore and refresh the look of your home ultimately saving you the potential cost of partial or whole roof replacement. Roof restoration allows early detection of any wear and tear leading to more serious replacement costs. Increases the value of your investment- a well-kept roof presents a well looked after investment. Regular inspections prevent any minor damage from escalating reducing any major replacement costs. 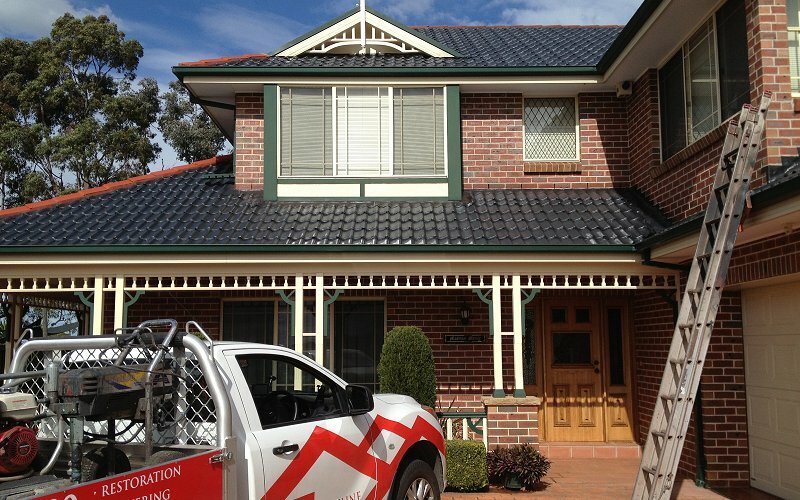 Terracotta tiled-one of the few companies in Australia that specialises in painting terracotta tiled roofs. If you have any questions call one of our team members today- we offer obligation free quotes. Our onsite teams respect your home and provide prompt and non-invasive cleaning services. So, you are assured of professionals who will provide above standard customer service and cleaning services beyond your expectations at surprisingly low cost. Rooflines’ comprehensive high-pressure clean of your roof ensures any build-up of algae, moss or lichen will be removed which instantly transforms the appearance of your home. If you find leaks, or water flowing down your walls this can often be attributed to blocked gutters or a build-up of moss. A good thorough high pressure clean, to remove the build-up of moss usually clears the gutters and increases the drainage. Our teams have extensive industry experience providing Glenhaven customers with quality services for over 20 years. Our qualified roof plumbers are equipped to professionally and competently install your home gutters. If you have a home with specific guttering design needs, we specialise in custom made flashings as well as custom-made box guttering. We often find that once roofs have been painted and look neat and new the spouting tends to look old and worn. Roofline can assist by providing additional value-added services to give your home a completely updated look by either replacing gutters, downpipes or by replacing/repairing missing tiles, fascia boards and soffits. We provide you with exceptional quality roof restoration services using the very latest in equipment, and technologies to ensure you receive the most effective and long lasting results for your home or business. Our teams’ core values are evident in our day to day working relationships. If you need more information or would like to schedule an appointment for an obligation free quote, we are always on hand to answer your questions. Our team is dedicated to roof restoration and care excellence. So, the final question is how can we assist?